The organizational bureau of the Kazakh Soviet Socialist Republic (KSSR) Union of Artists was established in Alma-Ata in 1933, with only 12 member-artists, all residents of the city. Even though it would seem there was no basis for it, as early as 1935 a decree was issued to establish a National Art Gallery of Kazakhstan. The fact that the gallery was founded at the same time as Kazakh art was beginning to develop reflects the unusual history of the museum. The nomadic culture of the Kazakh people made the advancement of various kinds of applied arts the principal national art form. Painting, sculpture and graphic arts came to Kazakhstan with the new government, new ideology, and new policies of national development. From the beginning it was determined that the status of the new collection was to be "encyclopaedic". This was exactly the challenge, as it became necessary to build different collections at the same time — first and foremost, the fine and applied arts of Kazakhstan, but also Western European art, and Oriental art. It took time for the Russian art section to come together — years went by before it took its current shape, numbering close to 1,000 works. The first acquisitions arrived in 1936-1939 with the help of the major museums of Moscow and Leningrad — the Tretyakov Gallery and the Russian Museum — which transferred some of their pieces to the new museum free of charge. This was common practice at that time, not only with regard to Kazakhstan and other republics of the Soviet Union, but also benefitting Russian provincial museums. The second stage in building the collection started in the 1950s, when a team of professionals dedicated to museum development came together at the gallery. Their active cooperation with collectors in Moscow and Leningrad, as well as artists' relatives, led to a significant influx of Russian art, especially from the turn of the 20th century. It is amazing to consider how events, facts and people's very destinies become intricately intertwined with the fate of the objects they have owned for many years. Such is the story of the paintings by Konstantin Korovin in the collection of the Kasteev Art Museum. In 1961, two portraits by the famous Russian artist were acquired by the museum, the "Portrait of Vladimir Arkadievich Telyakovsky" (1901), the last director of the Russian Imperial theatres, and "Portrait of Gurly Loginovna Telyakovskaya" (1905), his wife. For the museum, this acquisition was a rare case of good fortune, considering that Korovin had moved abroad in 1928, and in the 1960s it was almost impossible to obtain his work. The two portraits were of the parents of Vsevolod Telyakovsky (born, in St. Petersburg, February 20 1894, died, in Leningrad, January 7 1963), whose own life and artistic career (not from his own choice, however) were connected with Kazakhstan. For many years, the two portraits were in his possession, and it was only on the eve of his departure from Alma-Ata that he transferred them to the museum. In the 1930s, many artists, especially those from Moscow, became interested in Kazakhstan. The first wave of that active interest came in 1930-1932, the second as early as 1935-1937, and the third one was caused by the arrival of evacuated civilians during World War II. Many were attracted by the exotic life and diverse nature of the area, as well as the subject of industrial development in the republic. However, a sad chapter in the history of the USSR is also connected with Kazakhstan. From the 1930s, it was a place of imprisonment for many people, including members of the artistic intelligentsia, at the infamous "Karlag" (the Russian abbreviation for Karaganda Corrective Labour Camp) and "ALZhIR" (Akmola Corrective Labour Camp for Wives of Traitors of the Motherland). There was also another method developed to humiliate human dignity and oppress people — exile — when an individual was literally removed from his or her normal everyday life and thrown into the unknown. The exiles' lives were spared, but they were denied everything else — the company of their relatives and loved ones, the ability to work creatively, even the possibility to think about the future. 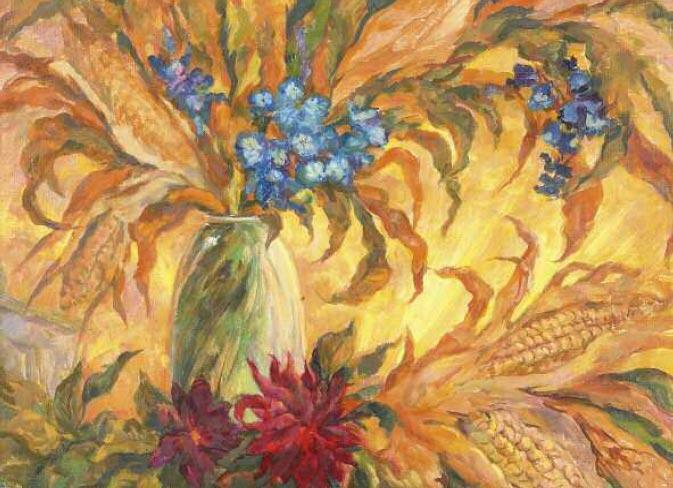 Among well-known artists who were exiled to Kazakhstan were Vladimir Eifert, Isaak Itkind, Vladimir Bekhteev, Abram Cherkassky, Leonid Brummer — their names are firmly established in the republic's art history. This was also how Vsevolod Telyakovsky, who could otherwise have enjoyed a brilliant career as a theatre set designer, found himself in the steppes of Kazakhstan. 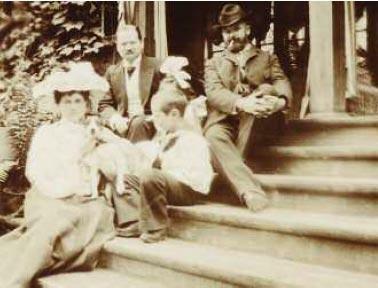 As to his life "before Kazakhstan", we know that Konstantin Korovin and Alexander Golovin were his first teachers. Telyakovsky wrote in his memoir: "In my world, Korovin and Golovin were inseparably connected, since they were like my 'godfathers' in art, and up until the revolution they often looked over my work and guided my first steps. "1 It was following their advice that he decided to make art his profession, and in 1912 went to Paris to study at the Academie Ranson, under such famous French artists as Maurice Denis and Felix Vallotton. However, he was unable to complete his education because of the start of World War I. In 1918-1924 Telyakovsky worked as an assistant scene designer at the Opera and Ballet Theatre in Leningrad (where Golovin was artistic director at the time), and as a professor at the Institute of Architecture in 1925-1927. He was arrested in March 1935, even though some have argued that it actually happened much earlier, at the end of the 1920s and beginning of the 1930s. It was a time when there was a campaign to exile those whose only fault was their "aristocratic origin". However, as early as 1936 Telyakovsky was transferred to Alma-Ata. According to unconfirmed data, Ilya Zilberstein facilitated that move3; however, there may have been a simpler explanation. In 1934, a new opera and ballet theatre was established in Alma-Ata, at the time called the Unified Theatre of Kazakh and Russian Opera and Ballet. In accordance with Order No. 10 of the Administration of "Kazgosmuzteatr" (the Russian abbreviation of the theatre's full name) of January 21 1936, Telyakovsky joined the theatre's staff as a set designer4. He worked there until 1938. 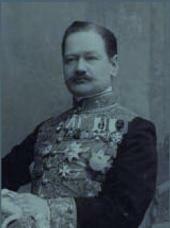 It is a paradox of history that Telyakovsky's grandfather, Arkady Telyakovsky (1806-1891), the leading expert in military fortification in Russia of his time, was one of the creators (along with Eduard Totleben) of the master plan for the fortress to be built on the bank of the Malaya Almatynka river; the plan was approved on March 7 1854. The fortress was transformed into a settlement named Verny, then renamed Alma-Ata, which became the capital of Kazakhstan in 19275. It is a shame that we have so little documented evidence of Telyakovsky's career during those years; it is also, however, understandable. Even the indifferent wording of official administrative "orders" reveals the artist's work ethic. During the first year of Telyakovsky's work at the theatre, the administration made an announcement thanking the artist for his dedicated work on set designs for new opera and ballet productions, in spite of illness6. Those who knew him in Alma-Ata remembered him as a quiet, modest man. The writer, poet and journalist Yury Dombrovsky was first exiled to Alma-Ata in 1933 and ended up returning there many times after his releases from labour camps. Dombrovsky dedicated a whole chapter of his book "The Messengers. Stories of Artists" to Telyakovsky. He recalled: "... I'd known Telyakovsky for maybe 20 years. However, to me he always seemed to be the same age, whether he was actually 50 or 70; he was short, with delicate features, light-coloured eyes and a clear gaze. He dressed with almost 'sterilized' modesty and neatness. He did not shine, and wasn't at all one of those people who make a memorable impression the very first time you meet them. ... as to questions related to his art, he almost never talked about them. I caught on to this idiosyncrasy of his right away, and never asked him questions, just kept studying his paintings that were hanging on the walls of my room. At first I had just two, and in the end ten or 12. Thus, as someone once said jokingly, I accumulated a whole "Telyakovsky gallery"7. In 1938 Telyakovsky was transferred to Aktubinsk and appointed principal set designer of the local theatre of music and drama, also a relatively new establishment — it was founded in 1935, developed from the local railway workers' amateur drama society. The population was being actively "introduced" to the arts, and theatres were "growing like mushrooms after rain". In August 1941 he was again back in Alma-Ata, where he started working at the same opera theatre, now called the Academic Theatre of Opera and Ballet8. During the years that he worked at the theatre, he created set designs for the operas "The Queen of Spades", "The Snow Maiden", "Eugene Onegin", "Faust", "Pagliacci", and the ballet "Swan Lake". Apart from set design, throughout most of his life Telyakovsky also worked on his book "An Atlas of Russian Historical Costume". According to Lev Warshawski, an art expert and journalist who also found himself in Alma-Ata in the 1930s "against his will", the artist created a unique collection of sketches — costumes of all times and nations. There were close to 20,000 exceptionally accurate colour drawings in it, often accompanied with detailed annotations, and always stating the original source every costume was copied from. The artist also gave instructions as to what materials could be used to recreate costumes for the theatre.9 The book was ready for publication; the artist selected 3,000 drawings for it, but was not able to fulfil his dream at the time. Telyakovsky designed sets and costumes for more that 55 productions at the Youth Theatre, almost all its repertoire, including "The Snow Queen", "The Two Captains", "I Want to Go Home", "The Three Musketeers", "Certificate of Education", "Altyn-Saka", and many others. 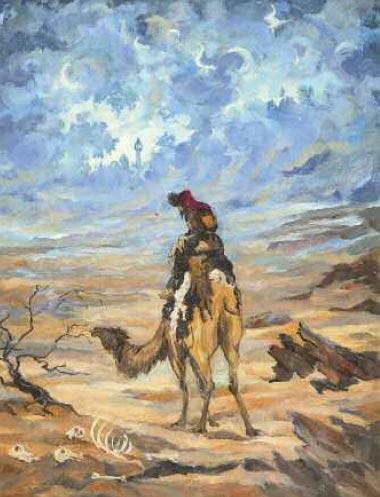 As he was leaving to go into exile in Kazakhstan, which in itself was synonymous to "a journey to nowhere", into the unknown, with no premonition of what his future might hold, Telyakovsky took with him a small collection of art — it seems the few things that were left from his parents — as a reminder of his past, different life, things which connected him to a world that was gone forever. He would not part with those things for a long time. Among them were his parents' portraits by Konstantin Korovin, painted while the artist was a guest at the Telyakovsky family estate in Otradnoye. He never let go of these portraits, and it was only on the eve of his return to Leningrad in 1961 that Telyakovsky handed the canvases over to the Taras Shevchenko Art Gallery of Kazakhstan (the museum's name before 1976) for temporary storage. The deed of transfer to the permanent collection was signed by Natalya Vetoshnikova, Telyakovsky's relative; the artist lived at her residence when he returned to Leningrad, and she inherited his estate on his death. Today, his deed is seen as a gesture of respect and gratitude to a nation which gave him a chance not only to survive, but to realize himself creatively as well. 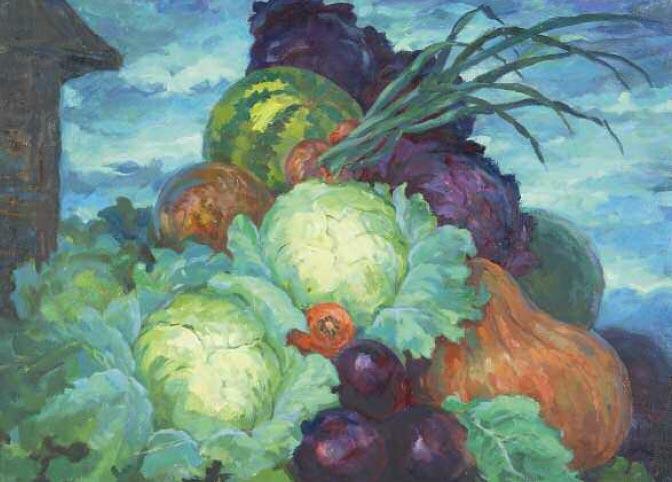 Telyakovsky also contributed to the cause of museum development by donating paintings from his collection to the Kasteev Museum of Art, and a distinctive "Telyakovsky gallery" was formed within the museum. Over the years Telyakovsky gave the museum several paintings and drawings by Korovin, including the unique "Portrait of the Railway Engineer Sergei Konstantinovich Feylezen" (1904), watercolour studies of theatre costumes, and easel paintings. "Tsarevna of the Sea" (1904), a mixed-medium work by Mikhail Vrubel (with an inscription in Telyakovsky's hand "Given to me as a present personally by M. Vrubel in 1904") was transferred to the museum in 1952. Another of the artist's gifts to the museum was a collection of authenticated works by Korovin — seven sketches of theatre sets and landscapes by the Russian impressionist. The artist also donated 45 watercolour studies by his mother, Gurly Telyakovskaya, an amateur artist who assisted Golovin and Korovin in set design for musical theatre, as described in Telyakovsky's memoir: "My mother sketched the figures, often painted the faces and hands, and Golovin would confer with her and 'dress' them... so gradually, a series of costume sketches took shape, with the imprint from the two artists... with Golovin's signature at the bottom of the drawing." 12 "My mother assisted them [Korovin and Golovin] by sketching the costumes..."13 Among those we find studies for Cesare Pugni's ballet "The Little Humpbacked Horse", Charles Gounod's opera "Faust", and Ludwig Minkus' ballet "Don Quixote". It turns out Telyakovsky also contributed to the development of the museum's collection of Western European art by contributing paintings, drawings and sculpture by French and Italian masters. The museum acquired from him two sculptures by Louis Boizot, "The Abduction of Persephone" and "The Abduction of Orithyia by Boreas", which enriched its permanent display of Western art. Almost a third of the works in the Western European decorative art collection came from Telyakovsky: candelabra, clocks, fragments of silk and brocade textiles, and decorative porcelain. All these works were left to the museum for temporary storage before the artist left Kazakhstan, and later transferred to the permanent collection with the cooperation of the artist's heirs. 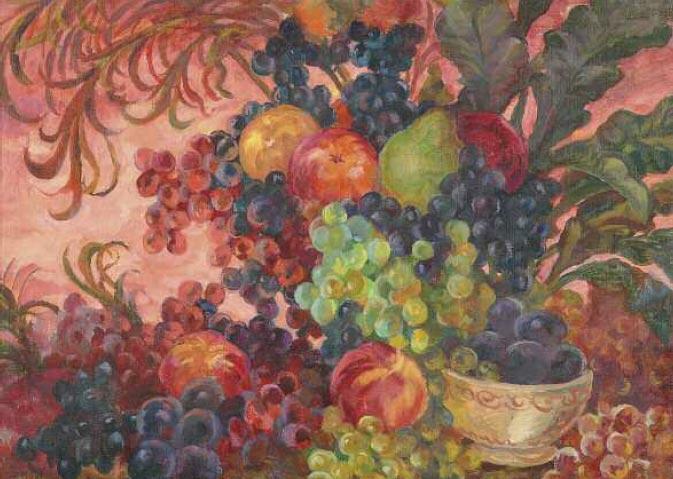 The artist's own works also became part of the "Telyakovsky gallery": several studies for theatre sets, a series of ten paintings based on Kazakh epic poetry, and still-lifes he started painting in 1959-1960, when he retired. In 1964, Natalya Vetoshnikova, who inherited Telyakovsky's estate, donated two unique drawings, made by the artist when he was eight and nine years old. 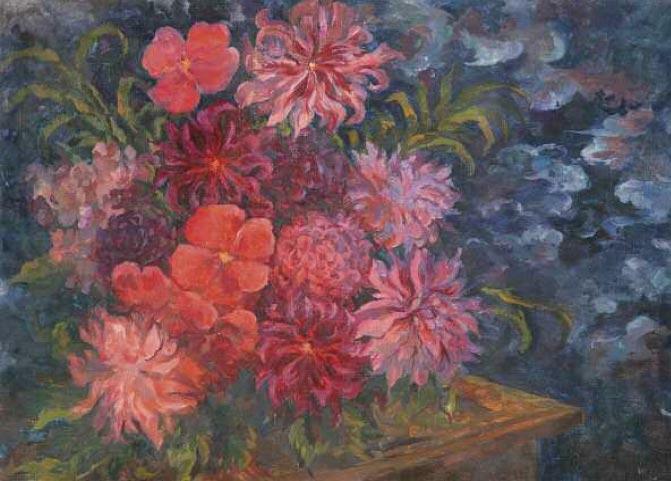 Vsevolod Telyakovsky was a member of the Union of Artists of the KSSR; on numerous occasions he was given awards by the regional Department of Art and the Presidium of the Supreme Soviet of the KSSR in the 1940s, before he was officially exonerated. In 1965 he was awarded the title Honoured Artist of the KSSR for his distinguished service. The 1950s marked the time when a professional school of art was just beginning to take shape in Kazakhstan. As a direct participant in creating Kazakhstan's major theatres, Telyakovsky made an invaluable contribution to establishing and developing artistic traditions in theatre and stage design. He did not have followers or students; however, he was a representative of Russian culture, an agent of its highest traditions in a new ideological and geographical space, thereby bringing the young Kazakh art closer to world heritage. Central State Archive of the Republic of Kazakhstan. Fund 1664, inv. 1. Manannikova L.B. "I Come from the Youth Theatre". Almaty, 2010. P. 61. Central State Archive of the Republic of Kazakhstan. Fund 1841, inv. 1. The Golden Book of Almaty — 2000. Almaty: Kainar, 2000. P. 67. Central State Archive of the Republic of Kazakhstan. Fund 1841, inv. 1, D. 2, Sheet 254. Central State Archive of the Republic of Kazakhstan. Fund 1841, inv. 1, D. 29, Sheet 99. Manannikova L.B. Op. cit. P. 64-65. Central State Archive of the Republic of Kazakhstan. Fund 2094, inv. 1, D. 26, Sheet 212. Manannikova L.B. Op. cit. P. 63-64. Central State Archive of the Republic of Kazakhstan. Fund 1664, inv. 1, D. 6, Sheet 15. Central State Archive of the Republic of Kazakhstan. Fund 1664, inv. 1, D. 6, Sheet 22. Vsevolod TELYAKOVSKY. Asan-Kaigy. Panel from the series on the Kazakh epos. 1957.